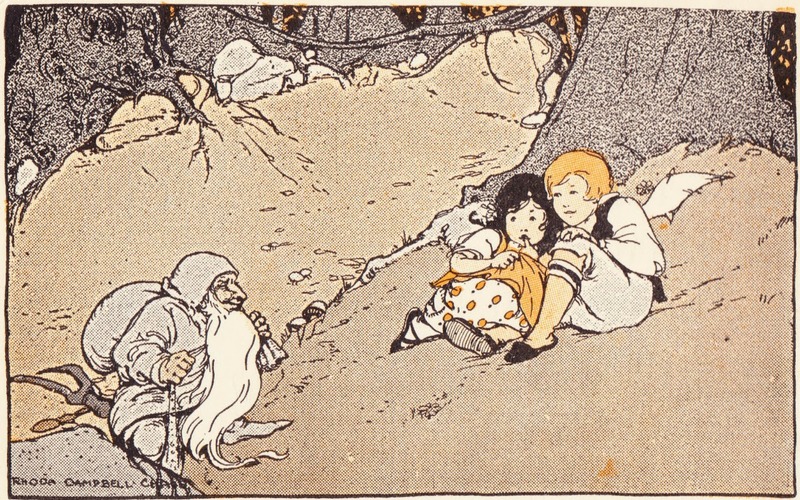 Papergreat: Rhoda Campbell Chase's illustrations for "Hansel and Gretel"
A century ago, in 1914, the American Book Company published Story Hour Readers (Book Three) by Ida Coe and Alica J. Christie. One of the book's primary illustrators is Rhoda Campbell Chase. But I can't uncover much about her, beyond the fact that most of her known work was in children's and school books published in the 1910s. 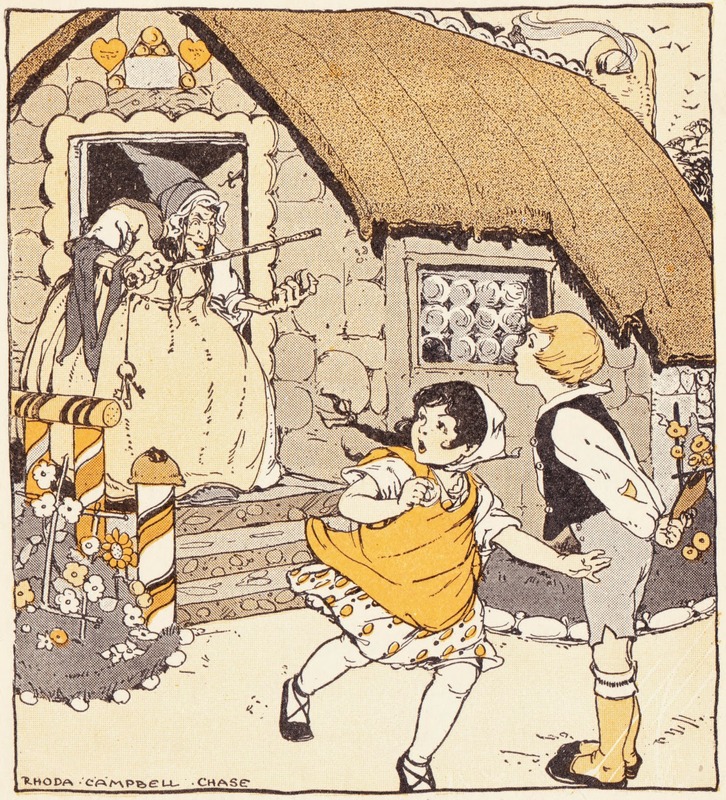 Chase provided seven illustrations — five of which are included in this post — for the version of "Hansel and Gretel" included in the reader. This variation seems to be based upon the 1893 opera by Engelbert Humperdinck and Adelheid Wette. For one thing, there's no wicked stepmother. (The Grimm Brothers' version didn't have a wicked stepmother, either.) There are also no pebbles or bread crumbs. Broom maker Peter and his wife, Gertrude, live in a cottage on the edge of a forest in Germany with their children, Hansel and Gretel. One day, the children are left home alone to do chores while their parents are away. Their labor becomes tiresome. "Come, Gretel, let us have some fun!" says Hansel, stirring up trouble. And so they do a little song and dance inside the cottage. The mother returns home, sees the frolicking children and chides them for their laziness. The mother attempts to punish Hansel with a whack of the broom, but he darts out of the way and she accidentally tips over a jug of milk, their only food in the house. Cranky mother (and can you blame her?) directs Hansel and Gretel to go into the woods to pick strawberries. She tells them not to return until their basket is full, "for there is nothing else for supper." 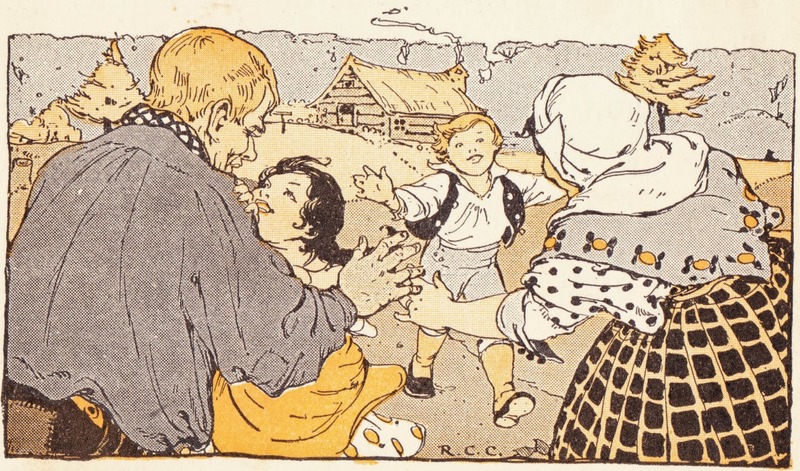 After the children leave to perform their task, Peter returns home with a bounty of food2 — he sold all of his brooms for a tidy profit — and is worried to hear that the children are out in the woods so late in the day. "I fear that the terrible Witch of the Forest may find them, and that we shall never see them again," he cries. Meanwhile, Hansel and Gretel, the bums, are taking their good old time picking strawberries. Also, they are eating the strawberries they do find, because they are so hungry. Soon, their basket is empty again. By now, however, it's too dark to see the strawberries. As Gretel begins to weep, they hear "soft voices among the trees," and the light of a will-o'-the-wisp heads toward them. Hansel and Gretel run and hide. A friendly little man with a long white beard finds them and sings a song that puts them to sleep, for he is the Sandman. 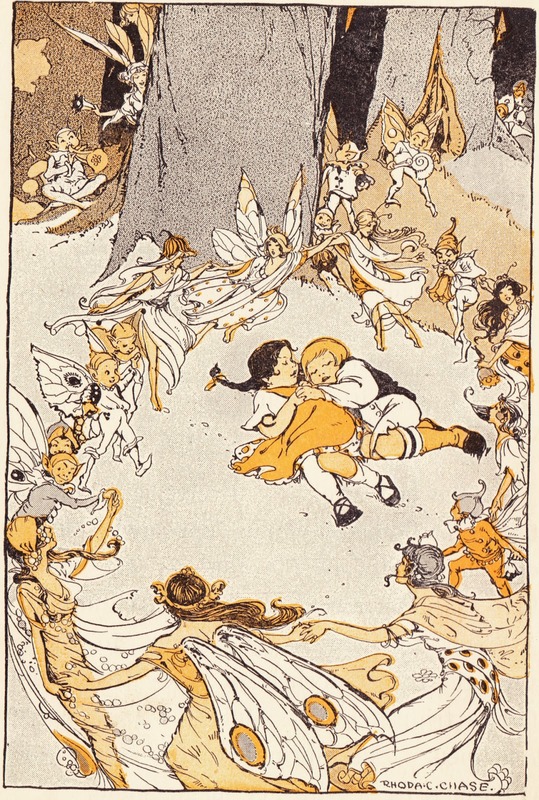 While the children sleep through the night, a group of elves, fairies and wood nymphs sing songs and dance in a circle around them. At dawn, the Dew Fairy sprinkles dew upon the children's faces with her magic wand. The children wake to find they are next to a house made of candy. The roof is chocolate, the windows are sugar plums and the fence is gingerbread. So the children nibble away at the house, of course. Suddenly, out pops a witch with a pointed hat and a stick. This is, of course, the Witch of the Forest. She's creepy and she invites the children in for candy, cake, apples and nuts. They decline and try to run away. But the witch casts a spell that freezes them in their tracks. Hansel is caged and fed sweets to fatten him up before he is cooked. The witch decides to bake Gretel first and directs her to set the table while she starts a fire. Then the witch decides, oddly, to take a ride on her broom while the oven (located in the front yard) is heating up. Upon landing, the witch directs Gretel to climb into the oven and see if it is hot enough to bake bread. Gretel declines, claiming she is afraid. The witch, inexplicably, climbs into the oven to show Gretel how it's done. Gretel slams the oven door shut, and that's that. Hansel and Gretel, as they are wont to do, sing a little song in celebration. They use the witch's Elder Bush3 to transform the candy house into a flower-covered cabin. Mom and Dad arrive moments later, and everyone lives happily ever after. Here are more of the illustrations for this tale by Rhoda Campbell Chase. 1. The Serendipity Project has the following mission statement on its home page: "The Serendipity Project will post a single item each day between May 1 2011 and April 30 2012. Items might be books, records, ephemera, objects, photographs or artworks. The contents feed visual and written material on sites linked to from this page." That makes it a neat companion site to Papergreat, and I hope its acts of "preservation" of this ephemeral material is further saved or preserved. 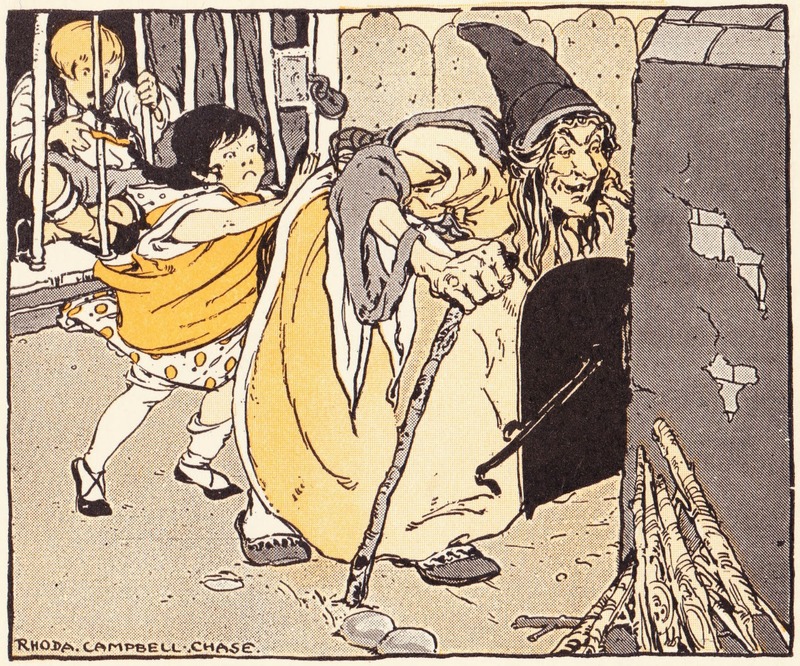 The Rhoda Campbell Chase post was published on February 13, 2012, and titled "ALTERED RHODA CAMPBELL CHASE ILLUSTRATIONS FROM TOLD BY THE SANDMAN BY ABBIE PHILLIPS WALKER (HARPER & BROTHERS, 1916)." 2. Bread, butter, potatoes, ham and eggs. 3. The sambucus (or elderberry) has a long history in folklore. Sometimes the plant was used by witches, and sometimes it was used as protection against wishes. The Elder Wand in the Harry Potter series is made of sambucus. "Famous People who have dined at Mader's"